Keywords can be used in a variety of ways but the main use is for receiving inbound enquiries. Having a memorable keyword on your advertising and marketing material is an easy way for someone who might be interested in your product or services to get in contact, instead of having to copy down your telephone number, mobile number or website they can simply text in. 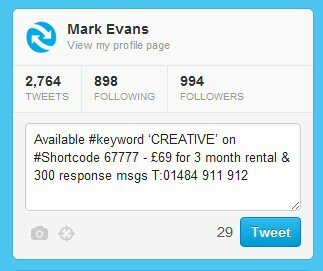 Here’s how it would work, the person wanting to place an enquiry would text ‘(Chosen keyword)’ to 67777. You can then respond to this message with a text reply saying ‘Thanks for your enquiry a member of the team will be in contact shortly’ and include a direct link to your website to encourage website traffic, then follow up the lead at an appropriate time. SMS Marketing is a quick easy way for you to monitor your enquiries as you get statistic reports for all your SMS marketing campaigns which allows you to track how effective this channel of communication is and gain insight into when your call to action is most effective.